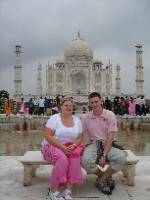 Blog from Agra, India | What have we Dunn today?! Another early start today as we headed off to Agra after a swift breakfast. Good to see a beauty of a Hyundai which would be our chariot for the next 3 days had only 102 thousand miles on the clock! I assumed this meant it had 'just been run in' as we left the outskirts of Delhi... I was wrong. It meant that it was a banger with tyres which were not up to the 'challenging' road conditions along Indian Highway 2 as evidenced by our flat tyre just as the heavens opened! No worry I assured Louise; he'll just stick on the spare and off we go.. I was wrong again! The spare had already been used that morning and was just as flat! Anyway, it gave us the chance to see Indian (in)efficiency in full flow. After hailing a tuk-tuk our driver left us parked in the middle of nowhere and disappeared off to get the spare fixed. He was probably as surprised as us when he returned to find about 12 people literally staring with their faces pressed on the windows looking at us. They proceeded to all help change the tyre anyway and off we went. Luckily this was the only serious incident en-route to Agra. The attempted sale of a monkey to Louise and the fact that all roads in Agra were totally flooded were apparently 'normal'! After downing bags at our hotel we headed off to the Taj Mahal with a guide recently enlisted by our driver. He did well and my comments over one who could use a camera were taken on board (see day 1 if this makes no sense!). 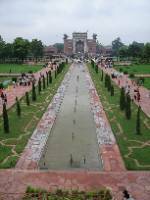 Ranjeev was clearly a man of the street as he guided us past queues and to the finest spots to see the Taj from. He also slipped at least a few notes to help us out! 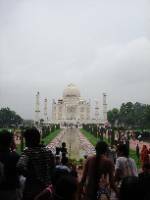 When you first see the Taj, it is truly amazing. The sheer scale and colour of it is unbelievable. It takes your breath away! As one of the 15,000 guests it sees each day we moved through the crowds and saw every last corner. Even managed a pic at the spot where Diana got a snap taken!